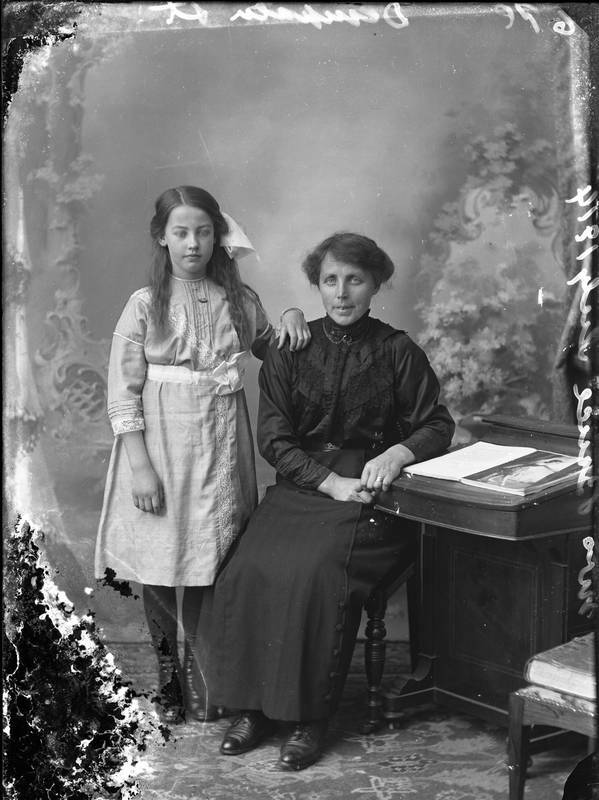 Portrait of a woman, seated, with a girl standing beside her. Ordered by Mrs Bruce, Dempster St., Wick, July 1914. "I believe this is a portrait of my great grandmother Alice Bruce (née Baillie) (1868-1954) and my grandmother Catherine "Kate" Clyne Bruce (1901-1985). Alice ran a small boarding house in Dempster street after the early death of her husband David from acute nephritis [inflamed kidneys] in 1902. Kate married my grandfather David Robertson the draper in 1922." ----- Thanks to Bruce Robertson, Australia for this contribution. Alice Baillie was a sister of Isabella Baillie - JNO6802P05, parents James Baillie and Catherine Clyne.